Reef Tiger Seattle series is definitely the representative of mens elegant taste, the newly launched The Pacific quartz chrono watch is inspired by the Pacific Raceways in south of Seattle, the watch integrates the racing spirit and watchmaking process, its elegant shape and 41mm size have an unique exquisite appeal, it is the best choice for fashionable men. The Pacific watch has stainless steel and pvd black options, stainless steel watch is elegant and full of personality, pvd black watch is fashionable and sporty. 41mm case is elegant and smooth, very suitable for men who pursue personality and taste. The watch is inspired by the Pacific Raceways in south of Seattle, it integrates the racing spirit and watchmaking process, the car dashboard is transformed into the chronograph subdials of the watch, the track becomes the time scales on the outer bezel of the dial. Black dial is calm and wisdom, red, yellow and blue three different colors echo with the track of the raceways, which deduces the fashionable version of Fast & Furious. 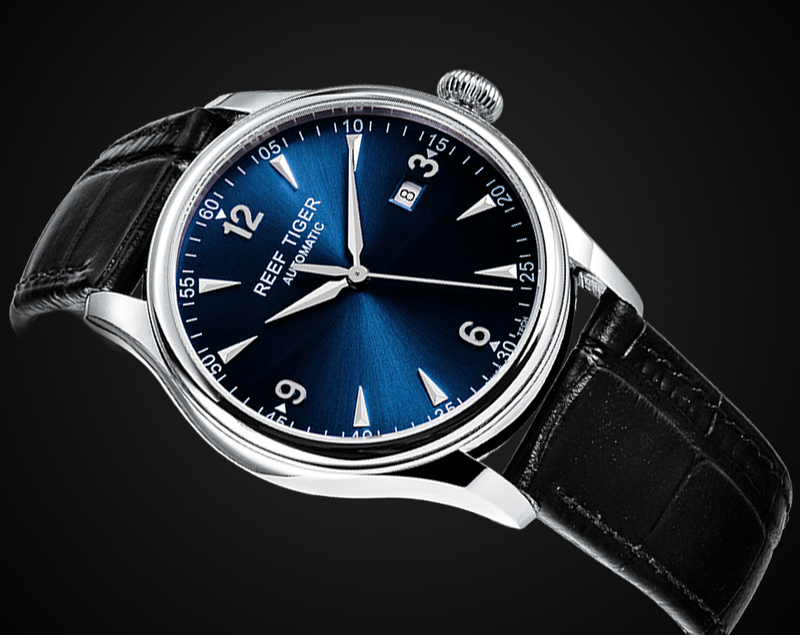 The date window is positioned between 4 and 5, the whole dial layout is harmonious, the whie date window forms sharp contrast with the black dial, and very easy to read. Three chronograph subdials are aligned, the small second hand at 6 runs one circle, the minute chronograph counter at 12 will forward one step, once the minute chronograph counter runs one circle, the hand at 9 will forward one step. In order to fit the refined sporty style of the whole watch, The Pacific adopts 3-link H-shaped band design, the middle links are bossed, the narrowed design of the two sides is distinctive.